As many of you know, my new book, The Simple Dollar: How One Man Wiped Out His Debts and Achieved the Life of His Dreams is due to be released at the end of this month and should be available in bookstores all over the United States in early July. If you’d like, you can preorder the book at Amazon.com or preorder it from Barnes and Noble. To put it simply, The Simple Dollar: How One Man Wiped Out His Debts and Achieved the Life of His Dreams tells the story of how I got into financial trouble and how I escaped from it. Intertwined with that story are the details on how exactly I did it, along with some really fascinating research into the deeper causes of my mistakes and how others make similar mistakes. Each chapter ends with five specific steps you can take to move forward in your own journey in line with the focus of that specific chapter – getting your debt under control, reassessing your career, figuring out what life you’d like to have and setting tangible goals to reach it, and so on. Rather than just tell you all about how wonderful I think the book is, I decided instead to share the book with some readers of The Simple Dollar and let them tell you about their experience with the book. A few months ago, I sent an email to all of the friends of The Simple Dollar asking for twenty five volunteers to get a free early copy of the book. All I asked is that they read it, they tried out the ideas at the end of one of the chapters of their choice, and after a couple of months, they let me know their thoughts on the book and how the tactics worked in their own life. So far, I’ve received 12 stories – a nearly 50% success rate, which is unheard of considering the effort I asked of the readers. I was hoping for three stories, not twelve, to tell the truth – that was the response rate that my publisher seemed to think that I would get in response to such an effort. The variety of the stories really inspired me, too. Most of the people chose different chapters and came at things from entirely different angles, with all of them getting something out of the book. The stories peeked into such a wide variety of lives – different ethnicities, different stations in life (from fresh out of college to retirement age), different ambitions, different life goals, and different beliefs. Yet they all were able to find value from stepping back and re-evaluating where they were heading – and perhaps looking at it through a new light. I have done no editing (with one minor language exception and one misnumbering of a chapter from the book in the middle of a paragraph) to any of these stories aside from editing a few personal greetings and other such notes from the beginning and end of them. Here are the stories I’ve received. I hope you find some of them as powerful (and often poignant and sometimes humorous) as I did. Click on the name to jump down to their story. Natasha discusses playing the “why’s” game from Chapter 17 which helped her effortlessly trim money from her food spending. Sheila rethought her shopping experiences based on Chapter 8 and started planning more carefully for them, saving hundreds of dollars. Rafal used five different tips from five different chapters to reinvigorate his career and build a personally valuable community of people around him. Jaclyn used the advice in Chapter 8 to not only re-evaluate her money, but to minimize some negative relationships in her life. Tonyre-establish a much deeper relationship with his wife using the advice in Chapter 13, starting with a intimate discussion about personal finance. Christina, a married blogger, used Chapter 17 to seek out positive motivators in her own life instead of the negative ones which were sapping her energy and spirit. Paul, a recent divorcee, used some of the ideas in Chapter 8 to add freedom to his life, including stepping up to the plate and tackling a triathlon. 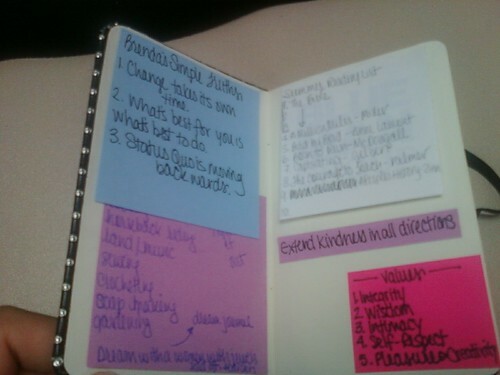 Jess used the ideas in Chapter 17 of the book to address the personal, psychological, financial, and physical clutter in her life. Mary used Chapter 13 as motivation to sit down with her boyfriend, only to discover they’d both been “secretly” lending money to the same person! Brenda used Chapter 3 to get control over the chaos in her life – along with a realization that not everyone else has their life figured out, either. Jessica used Chapter 14 to help her get a grip on the idea that retirement is coming, but that it doesn’t have to be doomsday for her life. Michael used Chapter 10 to launch himself into an entirely new career path once he realized what the common thread between his passions was. My husband and I are in graduate school (and therefore aren’t earning much money while racking up student loan debt) but our goal is to buy a house when we’re all done, so we need to pay down our student loans and also save up for a down payment. We’ve kind of kept a budget but not really done much other than track our spending and shrug when we go over. But we started to cull everything we could from our budget. No more cable television, no Netflix, no video game subscriptions, nothing superfluous. And from there, we started seeing where we could save money elsewhere, starting with our cell phones. We dropped our expensive plan (and phones) for a pay-as-you-go option, and are saving $60 a month that way, which I’m auto-depositing into our savings account. Taking Trent’s advice from this chapter to declutter, we’ve gathered together piles of books to sell online, which is on track to earn us about $250, which will go right into our savings. The biggest problem for us is food, not only for the money, but for the time and energy it costs. As I mentioned earlier, we have a budget, but food is where we consistently go over. And when we go over, we just…keep going over. So to address this barrier, I played the “Why’s?” game Trent mentions in his book. Why do we spend so much on food? Because we like to eat out. Because picking recipes and getting all the ingredients together takes too long. And this is where I had my A-ha! moment. We did make a huge production out of meals and grocery shopping, and had built our own barriers to make eating out much more attractive. So, we established a meal plan. I’ve planned a menu that we’ll recycle every week (same thing every Monday, etc. ), with the proviso that we’ll refresh the menu when we get sick of it. This works in a couple of ways. #1: We always know what we’re going to eat, and there’s always something planned with all the ingredients in the pantry so there’s less temptation to eat out. #2: Shopping is way faster because it’s just the same list each time and we don’t have to worry about cobbling together whatever we have to make dinner; it’s all there and ready (utilzing the second tip in this chapter to establish a passive barrier). So, now that I’ve addressed the food budget barrier, we’re putting it into practice, and will at least hopefully stay on budget (saving us an average of $100 a month) or maybe even save money if we can streamline errant shopping trips and frequent meals out (saving potentially $400 a month). For my “test drive” of The Simple Dollar, I chose to work on Chapter 8, “Frugality as framework.” It seemed like a natural place to start, since frugality has become necessity for my husband Steve and I. I lost my job in June 2009, just three months after we married and some months before my husband would earn his provisional green card. With neither of us able to find work and having fallen victim to a (hopefully temporary) glitch that has caused me to lose my unemployment benefits, we find that we are having to rely on savings and need to stretch every dollar we can. The first action step in this chapter is “Don’t give up the things you love.” Sadly, I’ve failed miserably at this one — we’ve had to give up nearly everything that we have enjoyed. My husband has had to sell most of his trap shooting and reloading equipment and I have stopped horseback riding, unable to afford the dressage lessons and fearful of hurting myself and generating additional medical bills. My husband is a real foodie, so we have tried to maintain quality of life in that department. After all, eating good food will keep us healthy and will help to keep Steve happy. The second action step Trent suggests is “Find inexpensive ways to enjoy the things important to you.” We have had a bit more success in this area. Although Steve can no longer afford ammunition and shooting fees, he has been spending more time coaching the son of a friend. Our friend is more than willing to provide a huge back yard for a range, some ammunition, and boxes of clay birds in exchange for expert coaching for his son, who has been struggling academically and is finding better focus in his studies since he has been doing trap shooting. Steve also loves movies, and rather than going to the theater (too costly even for matinees), we have begun in the last month to borrow movies from friends and from our public library. We enjoy snuggling with our dog on the bed and watching a good film. We both enjoy the outdoors, and we take more frequent trips to area parks for hikes and to stroll through the botanical garden. Steve is getting better about suggesting free and cheap dates, since I planned the first few, and we’ve had a really good time. Trent’s next action step for this chapter is to “cut back hard on the things that matter less.” When all my jeans ended up being more holey than godly, I re-read this chapter for Trent’s suggestions. I went to the thrift store to look for replacements, but I didn’t find any that fit me, so I found inexpensive carpenter jeans ($15/pair) at Target, and later I found a pair of imperfect jeans at another store for about the same amount. Steve and I began making our own laundry soap last year, using instructions provided by Trent on the Simple Dollar website, and it works just as well as the Seventh Generation detergent we had been using. As an added bonus, we’ve started to make batches or laundry detergent more frequently, swapping bottles of it with friends in exchange for homemade breads, gourmet dog treats, and other things. Action step #4, “Never go shopping without knowing exactly what you want,” has been a lifesaver. My husband has always had a difficult time restraining himself at the grocery store, sometimes spending up to $500/month for the two of us. I started using a slow cooker and the book Fresh from the Vegetarian Slow Cooker this past month, and I began to plan meals for the week and build a shopping list accordingly. I am good at sticking to a list, and so I do nearly all the grocery shopping now, and we’re down to about $300/month in grocery expenses. There is still some room for improvement, as Steve did pick up some snacks and protein drinks that put the total up a bit. But we are doing much better, and Steve has loved nearly all the dishes I have prepared. I laughed at Action step #5: “Use the thirty-day rule for any unplanned purchase.” Being unemployed, we have to put nearly everything on a wish list for when one of us is employed, not a 30-day list. That means parking the second car that now needs repairs, since we can certainly make do with one. I put off buying new clothes and getting a haircut (I trimmed it myself) for over 12 months. If there is anything that isn’t an absolute necessity at this point in my life, I have just given up on having it at all. If and when one of us finds a job, I will appreciate the income so much more, and it will be so much easier to say “no” to impulse buying — not only because of having been through a tight spot, but also from the great practical tips in this chapter. It was extremely difficult to take 5 action steps from one chapter. So I did not. You will ask – why? You have sent me that book in the very special time for me. It is my second job – I’m here for 3 months – after 4 months unemployment. I had to quit my last job due to economical breakdown. However I am living alone, debt free, trying to implement life hacking & personal finances tricks for a while. While I had my first job for little over year – I was keeping track on my income and expenses using Buxfer. As long as I was earning good money for my hard work it was a pleasure to take care about finances. Then it got complicated – and I’ve lost the track – some of the actions you’ve suggested were already taken and I had a lot of them in mind all the time – but I made some decisions which from financial point of view were terrible – I’ve moved again to the another flat with bigger rent – but I don’t regret It. Still… there were 5 actions to be taken. The first thing that looked like something I always wanted to do was “unwinding” 5th point of 5th chapter . After I come back I try to do the laundry and dishes. It’s terrible thing to start, but as soon as you get your hands wet – it’s mechanical activity. It was also connected with one of the New Year Resolutions – simple sticky note attached to my kitchen with “Keep counters clean” reminder. Every night before the sleep I used to prepare counters for the next day. Next chapter – about communities – I think that I’ve made my homework long ago – in Poland we’ve got Blip.pl – very similar to Twitter – but the local community in my city is really strong. We meet for a beer once in a month or so, we also travel to other cities to meet other members – it’s a great network of people having fun and helping each other. That’s how I’ve found this month my next flat. I’m moving out from the expensive one ( I’ve also got the place from a friend from that network) to cut back costs to the flat with a friend of mine who is moving to my city – pretty good deal as it will be twice cheaper. To be honest major part of my friends I hang out with were met on Blip during last two years –we are having a good time, and if there is a need – we support each other. Countrywide. Chapter 7th “Minding the gap” is something I think was doing for a long time – maybe not exactly that –but still I was doing my budgeting in 60%’s style. Now I’ve decided to get back to Buxfer. I’ve imported statements from accounts ( pretty messy thing, as I was not writing down expenses for about half a year) – but after weekend spent on it – It was clear what I was spending money on. Mostly bills, food and investment vehicles I’ve signed up during my first job. I’ve swept dust away from several banking accounts ( I’ve got my own System for keeping separate money for current month and rest of them) and got back to use it as I used to. Good thing is that after short analysis of my bills I’ve found out that I got used to being frugal and there were only small amount for cost that could be reduced. The biggest one is my flat that I’m changing right now. That decision was clear for a long time for me, that it has to be taken, but now I was even more motivated. When I’ve jumped back into fixing and changing – It was logical next step. And now for something completely different – what was my System? I had several accounts – one for Income, two for Current month – main account (only this was supposed to be used with debit card and ATMs), backup money for that month, and savings accounts (goals dedicated and “regular savings”). It was working well as long as I had motivation to make the money transfers between them. Now – I’ve got one. What else I can say? I’ve managed to sell some slogans I was writing on Blip.pl to be used on t-shirts in a shop owned by a girl I’ve met on Blip.pl. That not a big income – but to be honest – I’m very proud that I’ve signed that deal as it will be my first passive income. I’ve already decided that money will be split equally – half for the fun and the second half for the investment. I always wanted to learn how to trade stocks – and I thing I can use that small amounts to buy some. The book was very motivating for me, because of the author – which for me is an example, that if you try, other also tries to help you. Right now I’m thinking about switching my jobs either to the other company, or starting something own. Pretty though decision, but right now I’m having savings good enough for 3-4 months of living and I guess I’m about to use it. The opportunity for me to read and write a story about my experience with your new book could not have come at a better time in my life. I am 27, a recent University graduate (for the second time) and about to get married in September, and also horribly in debt. About 6 months ago I decided I needed a change in my life. I was buying things to fill a void in my life and I realized that things could not fill that void. Having the latest clothes, the newest gadgets and the fanciest home furnishings did not bring me joy. I was burdened by all of theses things and the incredible amount of debt that came with them. Unfortunately I have lived like this for so long that letting go of my attachment to things has been quite difficult. I decided to start my journey with the chapter on frugality, mostly because I thought that this would take me most out of my comfort zone. My fiance and I set up a budget together and it was pared down to only the most basic of necessities. Any extra money remaining at the end of the month was going to go against debt. We were already putting $2,500 of our monthly disposable income (a total of $6000 a month) against debt but I wanted to see if we could do better. We had already focused on big wins so it was time to delve into the details. We followed the steps at the end of chapter 8, here was our experience. 1. Don’t give up the things you love: This was really important to me, I knew that if I wanted to continue my new behaviors I would have to enjoy my life! We decided on a $200 a month each for spending money, which might seem like a lot but from how much we were spending it seemed impossible to me. I thought about that things that bring me true joy and decided that I would have to spend carefully on only those things if I wanted to be able to enjoy them. I decided to keep up my quilting class, which I love, and also my exercise group. These things were important to me and have a fixed cost so if I wanted to continue I had to keep paying. 2. Find inexpensive ways to enjoy the things important to you: Aside from the quilt class and my exercise group I could find ways to cut costs on everything else that was important to me. I like to go out for coffee with my girl friends so I made a rule that I could only have tea rather than an expensive specialty coffee. I like to read books so I made a rule that I couldn’t buy any books, I could only request them from the local library for free. It became a challenge I quite enjoyed to focus on the important things and drop all the unnecessary spending on those things. 3. Cut back hard on things that matter less: Cable television is not important to me at all so it was cut out completely. I also do not enjoy going for lunch with some of my negative coworkers so I started packing my lunch every day. I was no longer going to spend money on things that did not bring me joy. I thought about every purchase and wondered if I could find a way to hold off, or eliminate it completely. 4. 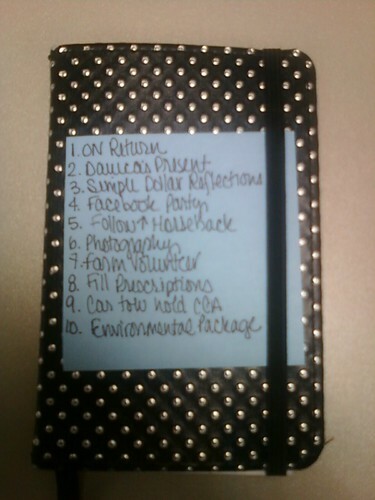 Never go shopping without knowing exactly what you want: I became the master of lists. We sat down on Sunday night and planned our meals for the week, only necessary things went on the grocery list. Likewise with household items, a running list was kept on the fridge of things we needed. I did not browse stores for the sake of shopping, I had a purpose or I didn’t go. It was actually freeing. 5. Use the thirty day rule for any unplanned purchases: As a recovering shopaholic I used this quite frequently. Often I would find myself wanting something and would think of many reasons why I needed it. As these things came up I told myself that I could put them on a list and at the end of the 4 weeks if I still needed them I could purchase them. I just looked at my list again today and not one thing on these is necessary, I am so happy I didn`t spend my money on any of those things! So how did we do? Well we managed to save an extra $1000 in the past 4 weeks, I also had $25 remaining of my $200 spending limit. Overall I feel lighter, like a weight has been lifted and I am so excited about the future! When i got the book i started to look at the chapters to see what would be the most important one for me at this time. I decided that the best thing was to find one that would work for my wife and i. I settled on chapter 13, The Personal-Financial boundary. The reason that i picked this chapter is i have always struggled talking to my wife about financial matters. I tend to hold things back and not let her worry about things. I am the type that i like to just take care of it. The thing that helped me out a lot was the ability to have certain things to discuss, and not just we are screwed and we got to do something. Those are the times that i tend to get to and that will in turn come to a lot of yelling and hurt feelings. With Trent giving his own story about talking to his wife Sara it helped me see a connection with me and my wife. I thought it was wonderful that you were not afraid to give us true feelings and exactly what went on with your relationship with your wife. At the end of the chapter you give five steps to Getting Our Relationship on Track, Here is a break down of what we did. 1) Set Aside time to talk to your partner about money and about life. This was a great chance for us to just talk. With having a little one around we find it difficult to just talk about us. We have been married for almost 4 years and we take time regularly but this time it was different. We were able to see goals that we both have in mind and how we want to accomplish them. We were able to see what things we can improve on and what things we are doing great. To share with you one goal that we both have set is we want to get into a house, we currently live in a condo, in two years. We have a lot of things that we both want to accomplish to see that happen, but being on the same page now is a great help. 2) Recognize that your partner is human and makes mistakes, just as you do. This was the most important aspect for me. Looking at myself and trying to put myself into my wife’s shoes with things helps. I try on my part to not spend money but at times i struggle when my wife wants to spend something. It is easy for me to say no to things, but often times i give in. My wife is much better at saying no to items but i am the one who says to just get it. By looking at myself with the mistakes i am the one who needs to change. 3) Confess mistakes to your partner and work with your partner to fix them. This past month there have been somethings that i wished i had not done, but my wife was there to say we can get through it, together. This chapter made me realize that we must work together to get through things and doing it together is the only way to do it. 4) forgive the debts and misdeeds of those who we care about and attempt to re-establish a connecting with them. When i read this i found it interesting that sometimes money or other items, can get in the way of our relationship. We do not have anything that gets in our way with relationships in this matter, but the key that helped me realize is when you are in a position to help someone who you love that is in need you should do it, with no strings attached. 5) Set aside time to build and rebuild the relationships most important to us. This past week i received a text message from a friend that i worked with for a very long time. We had lost contact with one another for some time. He is getting married and asked for our address. We talked how we need to get together and do lunch. Reading the book realized that over the years that i have cut short good and long friendships, do to my lack of not keeping in touch. We both agreed that it had been to long and that we both need to get together and do something. I have realized since i have been married that i often put my family way above others, which is good, but i often looser other ties i need. Trent, i enjoyed reading what i have with your book. With reading tons of finical blogs and books this one i feel ranks near the top and one that i plan to read and refer to friends. Most books i have read go into numbers and how to just get yourself out of the debt you are in. I feel some books need to go into a mental thinking of getting out of debt. Your book hits this criteria on the head very well. I feel that getting out of debt the first step needs to be a behavioral charge first, then start crunching the numbers. This past month has been wonderful for my wife and i. We take more time to talk financial matters. When we are out shopping we always ask if items are needs or just a want. My wife always asks if we have the money for a particular item. I have come to the point where i need to be honest with her and not cover things up. I plan to re read the book again and continue to apply the principals that you have given to help with our journey out of debt. Your story has inspired my from the beginning and it is my wish that i can start to see changes in my life to see great things and take control of my life. My husband and I made the pledge to get out of debt back in 2001. For the next couple of years, we tightened our belts and slogged through car loans and student loan debt. We became debt-free except for our house, and it has opened so many doors for us. We were able to build the home of our dreams near our family. We’ve been able to purchase two vehicles with cash. We’ve been ready for emergencies and been able to fund home improvement projects with cash. We’ve been able to afford for me to stay home with our three boys. We’ve been able to give to others and save for retirement. Some people think that frugal living is about deprivation. I see it as a tool to get to the life you want to lead. The answer is simple: Because we’re not finished yet. We’d like to get rid of our mortgage, do some traveling, and secure our retirement. That means we still have more work to do. If there’s anything I’ve learned from our journey to being debt-free, it’s that there is always more to do and always more to learn. The “Holding You Back” chapter of Trent’s new book really resonated with me. I’m a stay-at-home mom raising a 5-year old and twin 3-year-old boys. I’m the “chief financial officer” in our home – the keeper of the budget – the one who clips coupons and watches for ways to pinch pennies so that we stay on top of our goals. I started the blog to keep me focused on those goals and have been surprised to be able to earn a little bit of money from it – as well as getting the chance to explore writing opportunities. Trent’s book reminded me to ask myself why I’ve set up these impediments to my success. I realized that it’s not enough to make goals if I fail to take the action needed to complete them. I need to break these tasks into smaller ones and string them together to reach the bigger goals. One of the things I’ve started doing since reading this book, has been to try to focus more on all of the positive things in my life. Each night before I go to bed, I try to think of three positive things about my day. This has really helped me stay positive and to focus on what matters most to me: my family. I loved The Simple Dollar book just as much as I love The Simple Dollar blog because Trent is constantly challenging me to think about what things my family and I place value on. There’s no point in achieving financial success if you don’t know what you’re doing it for. As I am a recent divorcee trying to get my life back in order, I felt that Chapter 5: Frugality as a Framework would be a good one to attempt to implement this first month. It has helped change how I do things and makes me regard each purchase I make more carefully. It has helped me purchase with a purpose, rather than on a whim. For example: the fourth principle, to shop knowing exactly what you want, has forced me to be more purposeful in my food shopping. I have been making meal plans and food lists, not necessarily written down, but at least in my head. I know what I am buying and why I want that and how much to get before I enter the store. This has kept me from making unnecessary purchases, but also speeds up my shopping, as I don’t waste time wandering around the market trying to figure out what to get. It also simplifies things at home, as I know what I’m going to eat and how much I will refrigerate or freeze for later. As another example, I have recently started training for a triathlon. This can be a very expensive sport. However, by applying principles 2 and 5 from this chapter, I have been able to not only distill the sport to what its essentials are for me to meet my goals, but also to put off purchases that I can save for, lessening the impact of choosing this ambitious goal. By setting up a framework of frugality, by making that my mindset, I approach most purchases in a new light. I see things not as needs but as competing wants and take into account the impact on my fiances each want might have. For example, when mapping out my meal plan for the week, I acknowledge that I need to eat but what I eat is based on my wants, not my needs. I weigh the costs of certain meals and will perhaps decide to eat something fancy next week while eating more frugally this week, or try to find a cheaper way to make that meal that is normally fancy but costly. All of this will impact me in the long term both by helping me save money but also by helping me feel like I require less money to begin with. It’s easy to live life fully without living it as a spendthrift. By taking these steps, I can see even more how to live each thing, even small regular things like eating lunch, with purpose. By adding these purposes up, I find that I am designing a lifestyle that will help me to live a fuller life in the long run. The framework of frugality is freeing: it frees us both from the demand to make more money because we use what we have wisely, and it frees us by allowing us to live a decisive life rather than in the captivity of circumstance. The action steps in the chapter “Holding You Back” were really influential in shaping my mindset financially and personally. While my finances have improved leaps and bounds since reading your blog (and others) two and a half years ago, I occasionally stumble across a financial dilemma. Should I go out with friends for dinner, or should I stay in and cook? Where are my financial pitfalls? Asking myself “why?” makes me pause and contemplate the options. Nine times out of ten I pick a choice that is financially smart, and occasionally I splurge—a friend’s having a bad day, I’ve had a bad day, a celebration, just because. The chapter reminded me that this questioning can be applied to the personal realm too. Why do I feel bad about a conversation that just occurred? Why do I feel so tired this morning? Why did I do x instead of y? Doing this, mostly subconsciously, has made me pick and choose smarter, go to bed earlier, and think positively. It’s amazing how re-framing of something from the negative to the positive really influences our behavior. I have subtly become a much more optimistic person because of this effect. Instead of telling myself, “I can’t” or “I don’t,” I tell myself the reverse. Instead of, “I can’t run,” I told myself, “You can run. You need to take it slow and steady, and you can walk some too. You can read on how to prevent injuries.” It was just a matter of understanding my capabilities and expanding them. Today I ran 3.17 miles for the first time in my life, and I’m running my first 5K on June 26. The power of positivity is incredible! I already want to begin training for a 10K and beyond. This chapter is an excellent reminder that we have choices. Sometimes choices can be overwhelming if we have too many options. But we always have a choice between being happy or being frustrated or sad—to some extent—and we almost always have a choice between spending and saving. I’m amazed to see how many people have convinced themselves that they “need” certain goods or amenities, though a change in perspective would really highlight the unimportance of those material goods. On a final note, I address the issue of decluttering. I despise clutter. That being said, I still have piles of books, piles of papers, things that need to be addressed and taken care of. But decluttering matters in the long run: is this essential? can I cull it? what purpose does this serve? I even went so far as to declutter my book collection—something I never thought I would do. Instead, I have kept only the books that are most important to me and that I pick up again and again. I have culled expensive bookstore trips altogether and check books out at the library or retrieve them through PaperBackSwap.com. It’s really a matter of prioritizing your space, your life, and your sanity. I put in to action the five steps from Chapter 13: The Personal-Financial Boundary. My boyfriend and I have been dating for two years and had yet to ever talk about money. We just went about doing our own thing; paying what we needed to, when we needed to. We never had extra money to go out to dinner or have a date night, let alone save for our long term future goals of a wedding or children. After reading The Simple Dollar I got the courage to sit down and have “the talk”. We talked about where we were financially, what we wanted to do short and long term. We talked about things we could do to increase the gap between what we were spending and what we were making. We discovered that we both had been borrowing money to a mutual friend of ours, that we both had some old debts. Getting past the fear of the conversation was the hardest part, and the tips in The Simple Dollar helped us get on the road to financial freedom! I have been a regular reader of the Simple Dollar blog for over a year now. I have found incredible utility in many of Trent’s tips, tricks, and insight, and this book is no exception. There is a lot of material that has the potential to make my life easier and more financially secure, and that is incredibly valuable. However, I think that the most striking passage in this book is not a suggestion or an action item at all. I was most influenced by the anecdote where Trent details his darkest hour—the day he realizes what a financial mess he is in and the effect it will have on his infant son. As an avid reader of personal finance literature, it very often seems to me that the person giving the advice has everything figured out. If you check your thermostat, negotiate your interest rates, and cut your cable subscription, you too can have all of this and more! Unfortunately, we all know that it doesn’t quite pan out so simply. Oftentimes, I have found myself despairing trying to negotiate the difference between the way I am and the way I “should” be. I think my acute perception of that gulf is what made this particular passage so meaningful to me. See, by sharing the guilt and the embarrassment and shame of being in that situation, I realized that Trent didn’t always have it all figured out, either. At one point, he was in as bad of a financial state (if not worse!) than many of us. Many times, it feels like there is something essentially different about me—some sort of hubris or flaw—that put me in this situation. I think that maybe I am just not one of those people who can figure it out. But seeing Trent and reading about HIS despair and seeing what came of it tells me that that simply CANNOT be true. The essential difference, as far as I can see, is merely effort and will. I am sure that Trent’s path to financial success was not easily envisioned during that fateful night. There was not a ten step plan that arrived on his doorstep the next day, and there was no “quick fix” to the situation. But what this book has shown me is that there is hope. The road will be messy and I will have to find my own way, but if Trent could feel that way and figure it out, I can harness my effort, and my will, and my ingenuity to figure something out, too. And that, honestly, is more inspiring than I can express. More than anything over the past month, I focused on building a personal notebook. In the chapter “A Visit from the Black Swan” there is an action item that suggests carrying a notebook with you to collect information. I am the kind of person that navigates life via post it notes and I am constantly losing them and anxiously digging through my stuff for crucial information. I thought a pocket notebook would be a perfect way to cut that bit of chaos out of my life. In the same chapter, Trent suggests a focus on eliminating debt and automating savings. I thought that implementing a notebook would help to remind me that I am working on this in my life and focusing on where I spend my money. Also, Trent suggests using a 30 day list for any larger purchases in the chapter “Frugality as Framework,” and this notebook is the perfect place for that list to live. The notebook I designed has several different sections. Primarily, I have been using it as a place to track purchases and keep track of my budget, my automated savings, and my bills, so I can make sure that I am paying everything on time, and so I have the information to process where my money actually goes. It’s pretty hard to change the way you spend your money if you don’t know where it is going in the first place. 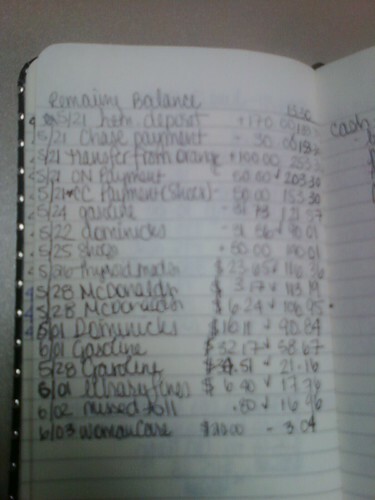 To start, I have just been writing down everything I spend my money on rather than trying to adjust spending habits. I have found that it is very helpful for me to observe myself before I start making massive changes. Having a predetermined place to write everything down allows me to do that. Also, the notebook has a notes section for a variety of different information. I have a place to put books I encounter that I would like to read, and a place for long term projects, and a little calendar and a section for ideas. I am apparently too married to the idea of post it notes to rid myself of them, but the front of my notebook is a handy place to put a post it note with all the short term things I need to take care of. Plus, it’s been really nice to have someplace to check every time I need to hit the paperwork and it has saved me from having to take multiple trips from the library because I have all the books I wanted to check out in one place! Overall, it’s been pretty simple to implement something like this into my life. I already carry a purse, so a small notebook isn’t a huge addition to my regular accoutrements. I love having one place to go to for everything, and even when I DO forget and write something down on a post it, at the very least, I can shove it in the notebook and it doesn’t get lost in my purse! This has been a GREAT way to see where I am spending money, and I like the fact that I can look back at my habits over the past month and try to adjust or eliminate superfluous spending. Over the long term I expect to continue to use this notebook. I am trying to develop the habit of putting all receipts into it as I purchase things and then doing a notebook check every evening to eliminate any crucial to do items and update my register. In the scheme of things, this was a very easy fix for my information management needs! And portable, to boot! I think that it would be fair to say that I have been on a personal quest for financial and personal integrity over the past year. After wallowing in my dead end job for a couple of years after college, I woke up to the fact that my 90k of student debt was going nowhere fast on my 30k a year salary. Over the past 12 months, I haven’t fixed things, per say, but I am at least heading someplace. I think the next step in my journey is to define “someplace” and start to design a lifestyle and a career that appeals to ME. I am hoping to tackle the chapter “The Power of Goals in a Random World” over the course of the next two weeks and do some serious and concrete planning from June 18-July 1 in order to round out the first half of the year 2010. I think that my efforts will be much more effective if I am working to get somewhere besides “not in debt.” I have found that I have been much more successful when I focus on the positive goal (i.e., focusing on being healthy and fit instead of losing weight) and I think that if I start working towards goals that will satisfy me, challenge me, and grow me as a person, some of the financial barriers to my debt repayment will ease as I open up new avenues for income and for community in my life. At any rate, I plan to use Trent’s action items in this chapter to start thinking about what the “ideal” someplace is for me and to start identifying things I can do to make that happen over the next six months to a year! In chapter 14, “Recasting Retirement,” Trent explains that life doesn’t end at retirement – it is truly a chance to put more time and effort into the hobbies and skills you didn’t have time for before. Sufficient planning for retirement is a necessity if you want to take full advantage of its opportunities. Here are the steps Trent recommends we take towards retirement, and how they’ve impacted me in the past month. 1. Spend some time thinking about what you would do with your time if you had a small supplementary income to help you live the life you wanted to lead as long as you stayed productive. This idea was immediately valuable to me, simply because I hadn’t considered it before. Personally, if I had a supplementary income, I would put my efforts towards helping others. I enjoy organizing, and would love to start a side-business helping people declutter and get organized in their homes. I am also very passionate about helping parolees rejoin and become contributing members of society. I would love to set up a half-way house, and work very hard on helping ex-cons find employment. 2. Plan ahead for your second act. I am a librarian – which means that I have a knack for organizing things, as well as multiple opportunities not only to network with other professionals, but also to expand on my communication skills. In order to plan ahead for my second act, I need to excel in my career and make as many contacts as possible. Already, this action item gave me the incentive to form a much-needed plan for working on the skills I’ll need during retirement. I’ve been able to come up with a list of opportunities I’ll need to jump on if they’re ever offered to me in the future, such as attending and/or presenting at networking events, conferences, and workshops. I’ve also started looking into becoming a prison librarian, because I feel very strongly that if a convicted felon has adequate access to an education, it’ll put them on the path to becoming contributing members of society once they have been paroled. 3. Take advantage of all matching funds in your 401(k)/403(b). Thankfully, I already had this one covered. 4. Open a Roth IRA for additional retirement savings. At the present time I’m not in a position financially to open or contribute to a Roth IRA, but I intend to do so as soon as my husband and I have the extra income. Right now we’re focusing on padding our sad little emergency savings account, as well as paying off some medical bills. 5. Make a master information document. For the past month I’ve been working on this master information document, trying to pull together any and all information needed in case I were to pass or be severely incapacitated. In the long run, I know my husband and I will be very glad to have this information readily available to our family members. We plan on purchasing a fire-proof safe, so that we can keep this information protected in the event of a catastrophe. Overall, I feel that these steps helped me to overcome some of my fears about retirement. In training your mind to always look forward, and try your best to be prepared for whatever life throws at you, we can feel secure in knowing that we’ve done all we can to deal with the inevitable bumps in the road. After reading this chapter, it is so nice to imagine what my life might be like when I retire – I look forward to a time when I can put my heart and soul into helping people with my passions and skills. The chapter that resonated with me most strongly was “The New Career Rules.” I put the chapter’s Five Steps into action for a few weeks and was really pleased with the results. The step that benefitted me the most was to discover what I am passionate about. I already engage in a wide range of activities, so that part wasn’t hard. The challenge was finding the common theme, which turned out to be writing. I want to be a writer. Step three was to join my passion with the transferable skills I already have. I was able to combine my GIS skills with writing to join a tech startup part-time as a marketer and publicist, something I’m really excited about. I also have been diligently pursuing freelance income as a writer. Finally, I’ve been writing every day, and I’m already improving. That’s really exciting for me because I wasn’t sure if I would be able to go from “good to great.” That’s step four. Step five, to turn my passion into a career, has not happened yet, but I have more options now. Because I’ve taken these steps, I’m more likely to be ready when I’m given a great opportunity.